The History Press, The Mill, Brimscombe Port Stroud, Gloucestershire, gl5 2qg (www.thehistorypress.co.uk), 2011. I must admit that I personally know Debbie Kennett as we both attend the Who Do You Think You Are? Conference in London every year. She is a delight and a go-getter when it comes to genealogy and genetic genealogy. Debbie has written several wonderful articles for genealogical magazines in the UK, and I’m pleased to see she has published a very timely book. 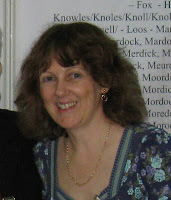 Few books have been published by genetic genealogists in the United Kingdom; however, Ms. Kennett’s book not only addresses the basics of using DNA testing to assist genealogists but the advantages of social networking. Although written for the British population with examples from her own project, there are many methods and suggestions that are applicable for any family historian and/or any genetic genealogy researcher. The book is divided into two sections: The Genetic Genealogy Revolution and The Social Networking Revolution. The forward is written by Chris Pomery, author of two DNA books. The Genetic Genealogy section gives an overview of the basics of DNA testing, the three major tests for the genealogy research with their uses and limitations clearly explained, and suggestions on establishing and running a DNA project. Several charts and screen shots enhance this section. This is the first known book to address the new autosomal testing done by Family Tree DNA and 23andMe. I was pleased to see the chart on the average percent of autosomal DNA shared with close relatives as well as a chart for the inheritance of the X chromosome. The Social Networking section of the book covers a large variety of areas where genealogist converse directly with other genealogists or can gain a wealth of information using the web. Ms. Kennett reviews traditional networking methods including family history centers, journals, e-mailing lists, message boards and forums. Of course, depending upon when a family historian began researching and the fact that the internet was not accessible to the general public until the 1990s*, some of these resources may not be viewed as traditional by everyone. But perhaps they are traditional methods when considering the recent interest in and advancement of social networking for genealogy and the speed with which it has grown. For genealogy networking sites, Ms. Kennett includes various paid and free genealogical websites which go beyond mere conversations with other genealogists. These sites offer the ability to establish online family pedigree charts as well as obtain genealogical data and converse with other genealogists. Features vary with each site. The use of current social networking systems such as Facebook, LinkedIn, Twitter, Google+ and others has greatly increased contact with people around the world who are not necessarily genealogists, but who may have an interest in their ancestors. Ms. Kennett discusses how genealogists use these forums to reach possible relatives for either sharing genealogy or for genetic testing to prove relationships. Another portion addresses Blogs which range from personal online diaries to information on a variety of topics on researching, resources, and DNA testing for genealogy. Ms. Kennett offers information about RSS Feeds to easily monitor all the blogs you wish to read. She also gives advice on free blog sites, and on writing and advertising your own blog. Wikis, online collaborative encyclopedias, cover a myriad of topics, and as Ms. Kennett has helped establish the International Society of Genetic Genealogy (ISOGG)’s Wiki, her knowledge is invaluable. The Multimedia section explores several sites that allow users to share photo with others. Projects have been established for entire countries with the goal to upload photographs of people and tombstones throughout the country. Videos on various genealogy subjects have been added to the web through RootsWebTV. Genealogy companies have shared information through YouTube. Various Podcasts allow researchers to download topical information on various subjects and interviews with knowledgeable personalities. Webcasts allow the attendee to stream the presentation live through the internet. Some webcasts are free; others are not. Webinars, similar to Webcasts, differ in that they allow the audience to give feedback. Online storage and sharing devices such as Google Docs can be a boon to genealogists who need to share or store large files. Over time any genealogist has hundreds of bookmarks saved as “favorites”, but if you use more than one computer or wish to share any of these with researchers, you need to export those bookmarks. Few browsers can do this, but Ms. Kennett’s book offers a solution through the use of social bookmarking websites that allow you to store all your bookmarks online and share them easily. The Voice and Video Chat section provides several resources such as Skype which allows the researcher several options: to make free phone calls with or without the addition of live viewing, to type messages similar to Instant Messaging or Chat in other programs, and to share files much faster than regular email. Appendixes provide a selection of DNA websites, Testing companies, DNA projects, Surname Resources, a Glossary, and a Bibliography. One topic of great interest to me, as it has been one of my “soap-boxes”, is what happens to your DNA tests after your death. Who manages it? I have had several testers in my DNA projects die, and in most cases, I found out months later while checking the Social Security Death Index. Humans procrastinate when it comes to our own mortality, but as an administrator of several DNA projects, I find this most important for us to consider. Ms. Kennett takes this a step further, asking who will care of all your online activities. Although she says the easiest solution is to leave written instructions in your will regarding your online presence, she offers several online sites that deal with these issues. Every genealogist wants their work to be preserved, if not continued, and our future generations need to know our wishes. In conclusion, it is wonderful to see that a book for genetic genealogists not only touches on the newer autosomal tests, but that it focuses on helping the genealogist and genetic genealogist get the most out of the social networking system. I am always excited to see another book being published for the genetic genealogist, and to have one that brings the researcher into the twenty-first century is wonderful! *The first commercial dial-up ISP was established in 1990 and the first webpage was created in 1991. The first email was sent in 1971, but the general public began using it until much later. RootsWeb.com was established in February 1996 by two genealogists in a mountainside cabin, creating the beginning of online genealogy! The book is currently available in the United Kingdom and will be available in the US in a few months through Amazon.com.